Restaurant Booths: Are they right for your eatery? Maximize space. Booth seating which has guests back-to-back requires less space, because you don’t have to allow for the room for guests to pull chairs in or out or walk in between back-to-back chairs. The overall footprint of a booth tends to be less than a table and chair configuration. Create privacy. There are a lot of reasons people love dining out, but if they sit in a sea of open tables with strangers chomping down their food an arm length’s away, they feel uncomfortable. Give them the privacy to carry on their own conversations. Naturally, people like their own personal space, and booths create barriers between tables and the other people in the restaurant. Restaurant booths are preferred among eatery guests. Use a wall – or don’t. Most people think that booths have to be against a wall and tables with chairs are the only seating that can float in the middle of the room. Not true! Create a row of booths down the center of a room, or use the finished backs of a line of single booths to create a room divider – and a long aisle of seating. The design possibilities are really endless, if you are open to trying something a little less traditional in your restaurant design. However, if you like the look of booths up against a wall, that positioning, of course, works well, too! Your restaurant layout is up to you! Offer kid-approved seating. When used against a wall, though, booths are proven to be family-friendly, as grown-ups can “trap” their rambunctious youngsters into the booth by sandwiching their tots between them and the wall. Plus booths allow a little wiggle room, and are usually more comfortable for a child than a traditional chair designed for an adult. Upsell, upsell, upsell. In addition, using a wall to “anchor” a table could increase dollars spent per party. People who sit at anchored tables, or booths against a wall, tend to feel “out of the way” from your other busy areas and stay longer. Sales at anchored tables are more likely to include an appetizer and a dessert than free-standing tables near busy areas, like an entrance/exit, a waitress station, the kitchen, or a bus station. Be flexible. A family of five arrives at the busiest dinner time, and you don’t have tables of a 4-seater and a 2-seater available to push together, but you do have an open booth. Chances are, even if you make it a habit to only seat four people in a booth at a time, that family will be able to squish together their smallest and be just fine. Because there is no set number of seats in each booth bench, your seating automatically becomes flexible, especially among families with youth. They may actually prefer the booth, which means you only use one table instead of two. Choose class. Restaurant booths can be very basic or upscale. They go great in pizzerias and fast food joints, or they can be added as seating at a fine dining restaurant. Custom designs allow for the right look for your place, so you can make sure they match your atmosphere and meet customer expectations based on your level of quality and service. Choose style. With so many color and style options, matching your restaurant’s decor will be easy! You may choose an all wooden look, an all vinyl upholstery look, a combination like vinyl seats and a wooden back, or just add some wood trim to your vinyl booth. Both wooden booths and vinyl booths offer several color options. Choose your wood finish or your upholstery color to match your other restaurant furniture and overall design. Restaurant booth styles are truly endless and can also be customized, so find the right one for you! 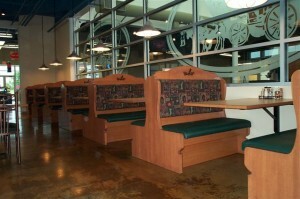 Most restaurants offer a mix of booths with tables and chairs for a balanced seating solution. Some also use banquette seating, which places a booth bench on one side of the table and chairs on the opposite side. Keep your customers in mind, and give them the restaurant seating they prefer. 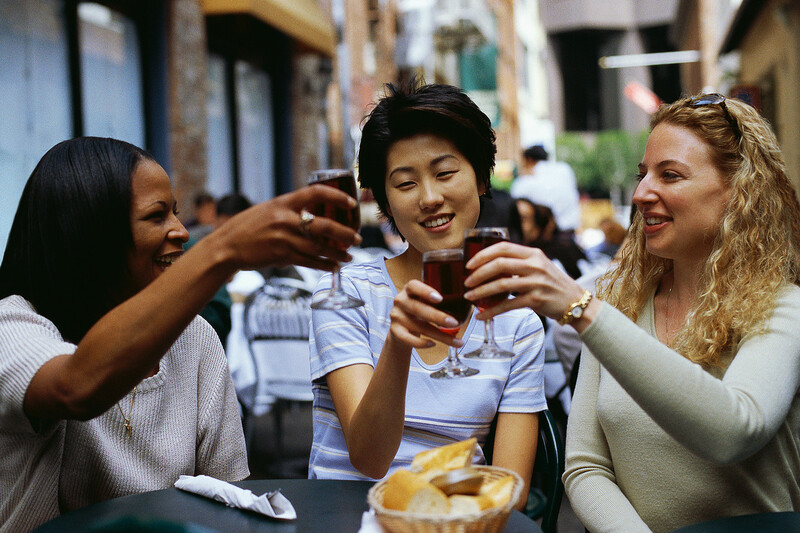 PS: Your hosts and hostesses love to answer positively when a guest asks about a restaurant booth – trust me! I was in their shoes once. Posted on Jul 26, 2012 in Design and Furniture Selection, Helpful Tips for Bar and Restaurant Owners • Comments Off on Restaurant Booths: Are they right for your eatery? Outdoor Dining – In recent years, the number of restaurants turning to outside dining has significantly increased. Customers are attracted to the great outdoors and enjoy knowing they have the option to sit on a patio while dining with friends. If you have the space and ability to serve diners outside, perhaps you should consider applying for the proper permits and looking for some outdoor restaurant furniture! Chef Grown Foods – The buzzword of the last few years has been sustainability, and restaurant chefs need to be aware of the change in how people think about food and where it comes from. Plus, economically speaking, if you can sustain some of your own menu items, it is win-win for everyone! Rooftop herbal gardens are popping up on cityscape restaurants, but it doesn’t stop there. Your restaurant may grow your own veggies, or take it a step beyond and consider a farm-to-fork program to raise your own meat, or even recruit a chef who doubles as a bee keeper. By controlling what ingredients you use, you also control quality, which is also important to you and your guests. Seasonal Menu Items – From fast food to fine dining, most restaurants introduce appropriate summer themed menu items. Whether you add bacon and barbecue sauce to your best selling burger, or launch a line of healthy salads (I recommend a mixture of strawberries, spinach, feta cheese, almonds, and a sweet poppy-se ed dressing), it’s summer time and you need to take advantage of the fresh foods available at this time of year and also meet your customers’ expectations for a sizzling summer taste. Offer corn on the cob as a new summer side dish, or challenge your chef to get creative with other fruit and vegetable recipes. Experiment with rhubarb, asparagus, or artichokes. Don’t forget it’s also a great season to get the freshest seafood from your local fish markets. Create your own spin on classic summer dishes or invent something brand new that hollers summertime. Summer can be done well, no matter what type of clientele you cater to, so don’t be afraid to introduce fresh new summer specials to your menu today. Less is More – Summer diners tend to enjoy smaller portions, maybe due to the heat or maybe due to a change in summer lifestyle where they are snacking more throughout the day and don’t need a huge dinner-sized meal when they stop into your restaurant. Be sure to offer some smaller portioned entrees, and don’t forget to give them a small shot of dessert, too. Keep in mind many people will meet up with friends for just appetizers and drinks more so in the summer, so adding a great summer appetizer and cocktail list to your menu will be well appreciated, too! Don’t forget to promote your local breweries and wineries, which often launch summer ales and new wines this time of year as well. Whether you have an outdoor restaurant or are just making the most of summer through your menu (and air conditioning! ), it’s a great season for your bar or restaurant.